Celtic artwork is based on a largely abstract style of curving lines. This is sometimes called the ‘La Tène’ style of art, named after a site in Switzerland where a large number of metal objects in that style were discovered. This particular design is inspired by the cheekpiece of the Agris helmet, a gold-plated iron helmet found in western France in the 1980s. 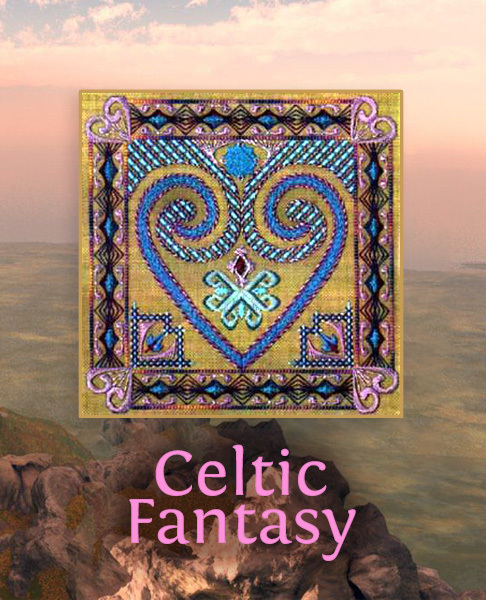 Celtic Fantasy is designed to be worked on 18-mono canvas. It uses Neon Rays, Rainbow Linen, Kreinik #16 braid, #5 pearl cotton, Flair, seed beads and Fine Mesh Velour or Petite Very Velvet. This is an older pattern, so some thread substitutions will need to be made.